A movie is not just what it’s about, but how it’s about. “Pacific Rim” isn’t good because it’s about monsters fighting robots, it’s good because of the way it shows monsters fighting robots. Yes, robots fight monsters. Yes, cities are destroyed. Yes, you may jump for joy. “Pacific Rim,” is the latest feature from genre mastermind Guillermo del Toro, who made The Pale Man of “Pan’s Labyrinth the subject of everyone’s nightmares. It is the equivalent of a young boy playing with his action figures: it is filled with awe-inspiring imagination, but its story is just a little bit on the faulty side. In terms of action movies, “Pacific Rim” is more “Aliens” than “Alien”: it’s about spectacle, not subtlety. This is not necessarily a bad thing, as this is the essence of every most major summer blockbusters since the 1980s. “Pacific Rim” has no limits, and its scope is often stunning. Del Toro clearly cares so much about perfecting this world and then tearing it to pieces. “Pacific Rim” made me realize something very important that pertains to the modern film industry: just because something is new, it doesn’t mean its original. “Pacific Rim” is not a sequel, remake, or adaptation of any kind. It comes straight from Del Toro’s mind. Yet, what makes this story different than “Independence Day”? Is it the fact that the aliens come from down below instead of from up above? The only thing missing from the opening as Raleigh Becket (Charlie Hunnam) crouches over the body of his dead brother (Diego Klattenhoff) is a high pitched “NOOOOO!! !” Despite this, human truly rises to the occasion. He has what it takes to become a blockbuster star. “Pacific Rim” doesn’t have a bad story. The problem with it is that it goes in so many different directions and never settles in one place. The film opens with a montage that is interesting but maybe a little too short. Monsters called Kaiju (literally the Japanese word for “monster”) have escaped through a portal in the Pacific Ocean and are destroying every major city they can find. So, you can guarantee that the Golden Gate Bridge will go down in the first five minutes. Yet, “Pacific Rim” is not only about the destruction, but the resistance. In order to fight back, humans build robots called Jaegers (Japanese for “fighter”). The Jaegers are controlled by two pilots who operate it through their minds, in what looks like a much cooler version of a virtual reality game. The mind control and mind-linking stuff can be a little confusing sometimes, but Del Toro and co-writer Travis Beacham constantly invent new rules to prevent them from following into plot holes. Also, there’s always a bunch of guys yelling things at computer screens. So there’s that. 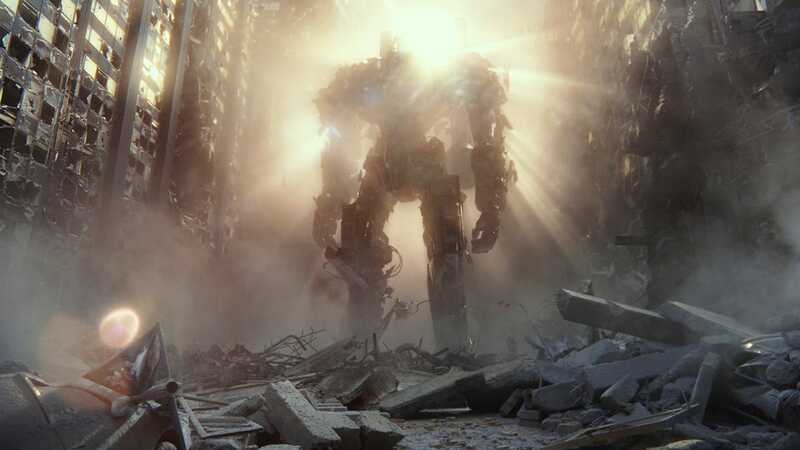 “Pacific Rim” can be labeled as a neurological blockbuster, with every character always trying to link mind and metal. This is by far the most intriguing part about “Pacific Rim.” In one scene, Raleigh finds himself inside a memory of his partner Mako Mori (Rinko Kikuchi). In this memory, she is a child who hides from a Kaiju that destroys her city. The scene is illuminated by terror and dust that falls like snow. It is beautiful and graceful and mesmerizing. It is staged in a way that every action movie and thriller should be staged from now on. Unfortunately, it is the only scene of this kind in the entire film. The complexity is dropped pretty early on. Because of this, the story never becomes convoluted However, the story instead relies on a lot of simplistic action tropes. This hurts some of the characters, who are actually stronger than the average blockbuster stick figure. Yet, Idris Elba’s Pentecost is stuck in “angry lieutenant” mode, serving to tell his subordinates that they’re off the job every time they don’t play by the rules. The only one who never slips into cliche is Kikuchi as Mori, who’s given the most interesting and disturbing backstory. I must give a big round of applause to Charlie Day, who provides comic relief as mad scientist type Dr. Newton Geiszler (it’ll take you a bit of time for you to get over that isn’t the same Charlie from “It’s Always Sunny In Philadelphia”), as well as Ron Perlman, who basically steals the show as Hannibal Chau, who’s profession is just as strange as his name. As many others have said, Del Toro is basically a big kid. His excitement for the kaiju genre is tangible and completely sincere. Del Toro is also a master storyteller, so maybe I am being a bit harsh on him. However, that is only because I know he is capable of much better. Ambition is a much needed thing for the movie industry, but it shouldn’t substitute brains. All in all, “Pacific Rim” may be the most watchable blockbuster of this season. Nobody can doubt the aesthetic, especially the score, which is an instant classic. I feel better about the film overall when I think about it for what it was, as opposed to what it could have been. After all, wishful thinking can only get you so far, especially when there’s giant robots and monsters fighting right in front of your eyes. This entry was posted in Charlie Day, Charlie Hunnam, Guillermo del Toro, Idris Elba, Movie Review, Pacific Rim, Ron Perlman on July 24, 2013 by ian0592.